This entry was posted in Maria B on March 30, 2014 by admin. The weekly entertainment, fashion and lifestyle magazine featured an image from the official photo-shoot of the MARIA.B. Lawn by Reshma Tex collection in a piece focused on spring fashion. This entry was posted in Maria B, Lawn 2014 on March 30, 2014 by admin. 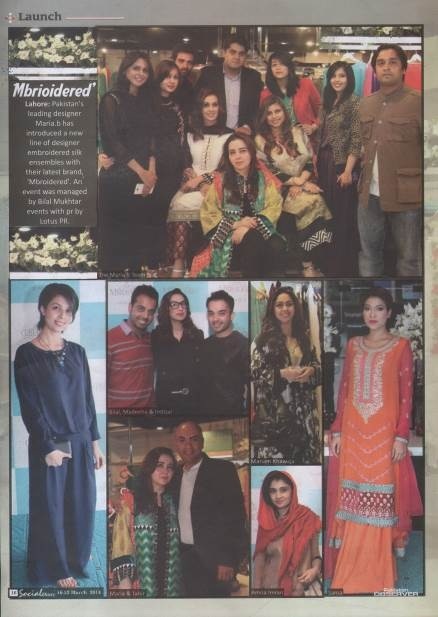 As coordinated by Lotus PR, the Sunday magazine of the leading Urdu language broadsheet featured the official photo-shoot of MARIA.B. Lawn by Reshma Tex. The photo-shoot was featured in the centerfold of the publication and was accompanied by the official photography credits of the shoot. An image from the photo-shoot was also featured on the cover of the publication. This entry was posted in Maria B, Lawn 2014 on March 29, 2014 by admin. The Facebook page of the leading fashion, entertainment and lifestyle magazine published a competition allowing fans of the publication to win 2 exclusive outfits from MARIA.B. Lawn by Reshma Tex. Till present the competition has garnered more than 2,500 likes and comments and had been shared more than 200 times. This entry was posted in Maria B, Mbroidered on March 27, 2014 by admin. The MARIA.B. Embroidered launch was featured on the Pakistani fashion, entertainment and lifestyle website. The content included 4 event images, detailed collection information and a quote by designer Maria B. on the new collection. This entry was posted in Maria B, Lawn 2014 on March 25, 2014 by admin. The entertainment section of the leading English language broadsheet published a report on the recently held Porsche National Polo Open which mentioned fashion designer extraordinaire Maria B., as being one of the media personalities who attended the event. This entry was posted in Maria B, Lawn 2014 on March 23, 2014 by admin. The Sunday magazine of the English language broadsheet MARIA.B. Lawn by Reshma Tex in its Hottest Picks section. The write-up titled “Make space in your closet for Arabi Lawn” share detailed collection information on the new lawn collection including details regarding its price, fabrics and number of designers. The write-up was accompanied by a behind the scene image from the official photo-shoot of the campaign. This entry was posted in Maria B, Mbroidered on March 22, 2014 by admin. The weekly fashion and entertainment magazine of the leading Pakistani broadsheet published a full page pictorial feature on the MARIA.B. Mbroidered launch. 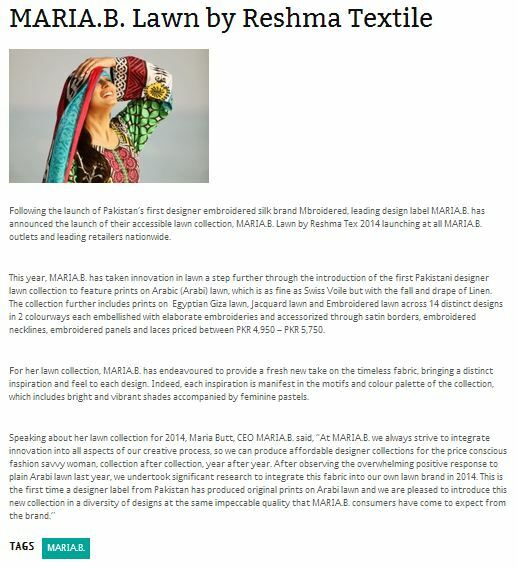 The write-up accompanying the event images mentioned that renowned designer Maria B. recently launched Mbroidered, a first of its kind embroidered silk line amidst much fanfare. 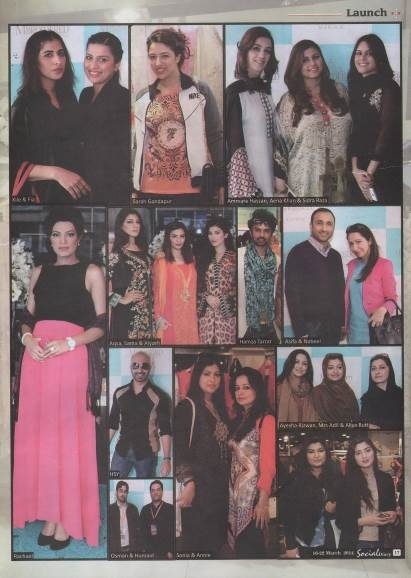 The page featured 14 images of designers, models and media personalities at the event. This entry was posted in Maria B, Lawn 2014 on March 17, 2014 by admin. The online fashion, entertainment and lifestyle blog posted the press release announcing the launch of MARIA.B. Lawn by Reshma Tex. 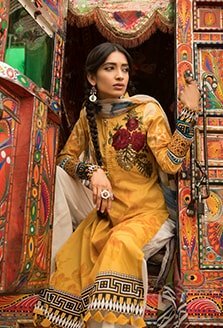 The write-up shared the launch dates of the collection and mentioned that this year the brand had taken innovation a step further through the introduction of the first Pakistani designer lawn collection to feature Arabic (Arabi) lawn. The write-up was accompanied by a behind-the-scenes image from the Lawn photo-shoot.